Dali New Town, which China flaunts today, is a long settlement along the shores of Lake Erhai and has almost swallowed up the small classic center on the western shore. 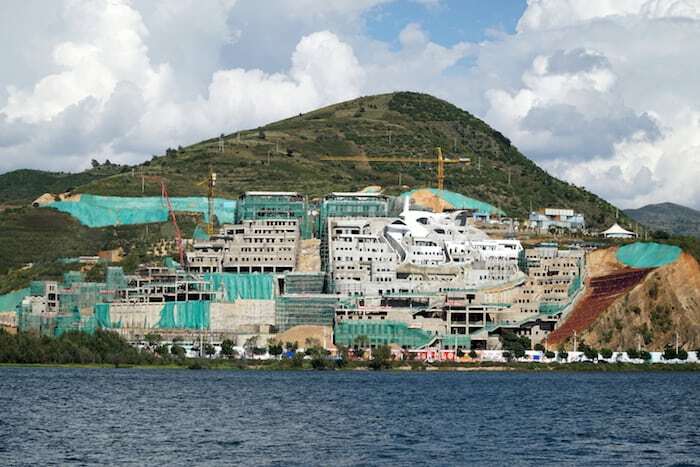 The hotels are all close to one another, the cars battle along the road that runs along the lake going from the airport to the old center, passing by new cement monsters that are increasingly huge and in bad taste, but represent progress. This is an area that has seen a prosperous kingdom, the Kingdom of Nanzhao, submissive to the Mongols, when the Bai Buddhists invaded and then annexed them to the Heavenly Empire; for a long time Yunnan was nothing more than a stop on the Ancient Tea Road (or the Southern Silk Road). Today tourism is an important source of its renewal, with all the pros and cons that comes with such speculation: local artisans struggle to resist serial production, homes give in to the temptation to convert into shops, the use of local costumes has become more for the tourists than tradition, at least for new generations. Actually it’s not just in Dali, but the entire northwestern part of Yunnan, where ethnic minorities battle daily with imminent type-approval. 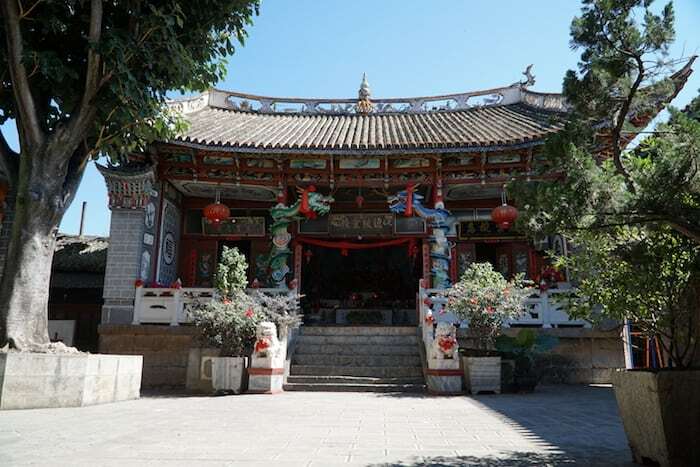 It’s here, you can say, that the situation isn’t yet so compromised as, for example, Lijiang, where the locals have almost completely abandoned the old inhabited center. This is to clarify my position as a tourist, which varies diametrically between fascination and disgust; and to make clear that in these areas it’s best to go as soon as possible since, when it comes to authenticity, there’s a relentless march that pushes Yunnan to lose something precious every day. The only alternative is to personally promote culturally responsible tourism. Dali, though located at an altitude of 1,900 meters, still doesn’t record the freezing cold of the most northern parts of Yunnan. The climate is generally mild and very sunny. It’s a pleasure to visit the city during the shoulder seasons, as much as it is as a summer destination considering that the thermometer hardly reaches 30°. Rather, the same recommendations for Kunming apply: the sun beats down because of the altitude, so it’s good to “apply cream” as needed during the day and keep in mind the temperature change between the early morning and night. 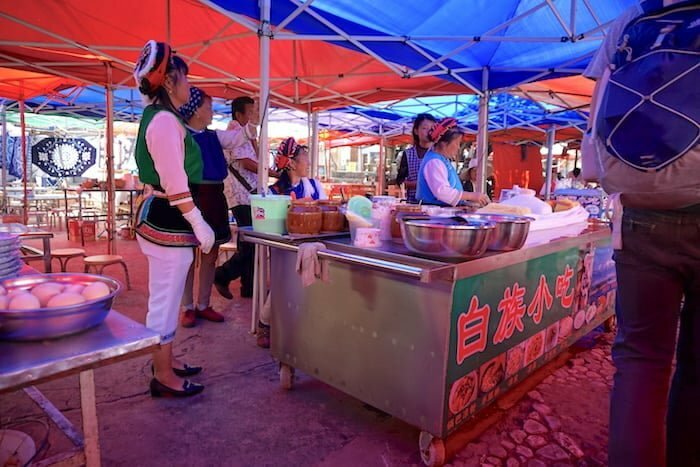 Usually Dali is one of the stops that you make on itineraries going to Lijiang or Shanghri-la: so being on the way toward the north, it often ends up being a base of operations for quick excursions to ethnic minority villages or the Cangshan Mountains. Then, a race toward Lijiang and beyond. As a result, in the old city, the small historic center is still preserved, you only need a half day to gallop between shops. But the finesse of what remains of the Bai rhythm and their buildings are best discovered by stopping a little longer and dodging the crowds. Dali airport 大理机场) is not served by international flights. It has a small terminal where only domestic flights come and go. So from other countries you’ll be forced to consider a stop at one of the bigger cities like Beijing, Shanghai, Nanjing or the closer Chengdu and Chongqing. 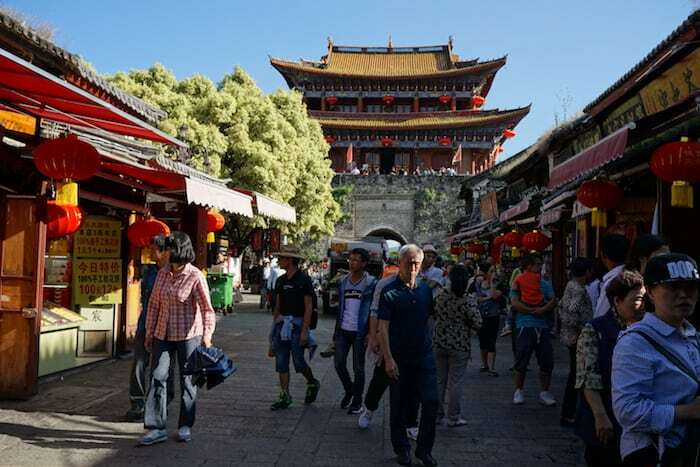 In particular, there are tons of daily connections with Kunming, which saves several hours of travel by road or train, since the flight lasts less than an hour. Dali can also be reached by long distance buses from Kunming, Lijiang and Shanghri-la. Some services travel by night, especially for the route to and from the capital. The inconvenience is that the bus station isn’t close to the historic center, but in Xiaguan, a good 14 km to the south. There are various connections, but the real problem is that there’s practically only one road, so traffic builds up easily. The rail option is limited to express trains; there are no high speed trains between the cities, which stops instead at Kunming. Between Kunming and Dali it still takes 6 to 8 hours of travel, while to Lijiang it’s a more bearable 2 hours. with tourist bus number 1 (古城自助游览车1号线) if you want to get to the entrance of Mount Cang park. Since Dali New Town was developed to the south of Old Town and all around the lake, much of the lodging is located outside the old city, and many have affordable prices. They are mostly modern buildings in a good location, that is, facing Lake Erhai or towards the mountains. But it’s still not the same as staying in old Dali. In fact, many of the hotels in Dali Old Town are inside of historic Bai buildings, with inner courtyards and finely renovated rooms and uniquely decorated doors. Personally, I stayed at the Fairyland Hotel Dali Zhong He Ju and it was a picturesque experience immersed in the general vibe of the city. This is why, if your budget allows, try to avoid the easy solutions of Xiaguan and spend a little more time looking for the ideal place inside the historic city center (even one of the renovated Bai homes!). Considering the size of the city, one corner is as good as another. The city itself is small and for getting around longer distances, taxis and public transportation are available. Click here to read our reviews on the best hotels in Dali. 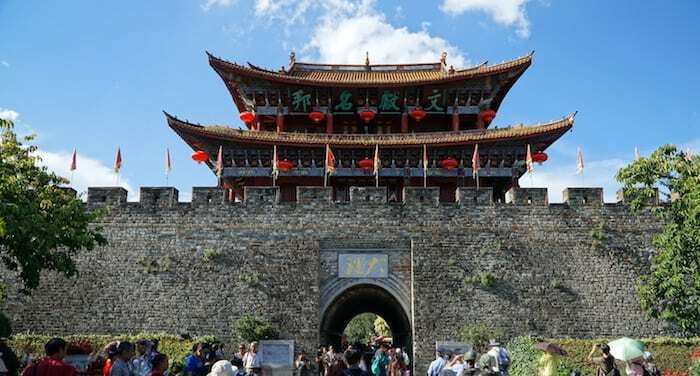 Dali Old Town (大理古城), or the historic center: surrounded by walls and marked by four imposing entrance gates on the four cardinal points, the city is squared off by roads filled by streets that today are populated by little holes in the wall and souvenir shops. To appreciate the magic, it’s good to walk through before the shops open, when the vendors tediously stretch as they dismantle the doors and pieces from closing the night before. At night it transforms into chaotic disco where the PR try to lure tourists inside, while the shop next door noisily works with silver to the sound of hammer blows. The main roads are Huguo Lu (护国路), Renmin Lu (人民路) and Hong Long Jin Lu (红龙津路). Avoiding the touristy zone, toward the east, you can still see some of the Bai authenticity. And also, sadly, architectural decadence, because many of these wonderful buildings are a little neglected if not renovated for tourism. Lake Erhai (洱海湖): literally the sea in the shape of an ear, this basin is 42 km long and 6 km wide. It’s an interesting area from a flora and fauna point of view, and offers wonderful landscapes…aside from the cement abominations built along its shores, in some cases only halfway finished. The shores of the lake were once populated by the typical activities of the Bai; here they fished with cormorants and grew rice on terraces on its banks. Now it’s easier to find fish markets and restaurants for tourists, even though these traditions still, in some way, survive. The most popular destinations on Lake Erhai are Putuo Island (小普陀岛) and the Sky Mirror Pavilion (天镜阁) which can be reached via boat tours that start from the dock at the village of Cai Cun (才村), not far from the old city. There are other little islands here and there, marked by a pagoda or a small temple. Some boat tours allow for a day of exploring even these little hidden corners. Be careful of the wind! Finally, the shores of the lake are surrounded by various visit-worthy villages (see the following). The Three Pagodas (三塔寺): is a large complex, recently enlarged, which actually includes three ancient pagodas and a modern temple rising up behind it. 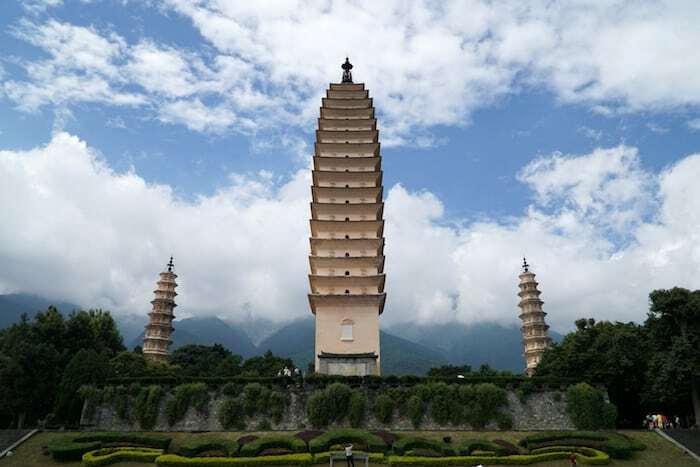 Of the pagodas, the most beautiful is without a doubt the queen of 69 mt., the “lady” Qianxun, which was built during the reign of Nanzhao and is one of the highest in China. It was inspired by the Great Pagoda of the Wild Goose of Xi’An.Sadly its 16 stories are presently off-limits because it is dangerous: furthermore, Dali has experienced several earthquakes in the past, and it’s almost a miracle that the three towers are still there in their original form. When the sky is clear and the pagodas are embraced by the Cang Mountains, the impression is quite enchanting. For this reason tourists are moved to go to the top toward the freshly painted temple. The temple is nothing special in and of itself, but in its entirety it is a pleasant view wrapped in the Cang Mountains, which on sunny days shines in vivid colors. It’s a little pricey to get in and the golf car that brings tourists up and down isn’t included in the price of the ticket. The Cang Mountains (苍山): the chain that surrounds the west shore of Lake Erhai and protects and watches over old Dali; the highest peak goes above and beyond 4.000 mt. The Cang Mountains can be explored on foot or by taking advantage of the three cable car lines. There’s a very easy path, full and paved, which crosses the chain east to west: to take the path, you can get to the Zhonghe Temple (中和寺) by taxi and start the 14 km. trek. Or, admire the area and panorama, and then go down by cable car. During the ride you’ll come across another cable car line (Ximatan) which goes up to 4.000 mt., or you could also say, brings you back down the valley if you’re done at this point. Continuing on, the path ends at Gantong Temple (感通寺), which from here you can go down to the valley again by cable car or make the last effort on foot, if you haven’t had enough. Since the path winds at altitude, being able to trek it depends on the weather conditions, so it’s recommended that you trek only if the skies are clear and doesn’t look to change. A better reason is because the visibility guarantees breathtaking views of the Three Pagodas, Erhai and Dali itself. Entrance to the Cang Mountains park costs 40 Yuan, but doesn’t include tickets for the cable cars (and each cable car requires a separate ticket). Depending on the route that interests you, it varies between a 10 to 20 km walk. The Bai villages, Yi and Hui: around Lake Erhai, but not necessarily nearby Dali, there are numerous villages, among which are a few preserved gems. They can also be explored by boat by going alongside the lake: it is a challenging cyclo-tourism itinerary if you’re looking to complete the complete tour (128 km), and certainly requires more than one day to allow enough time for the various stops that deserve it. They often go on days of the local markets, to combine a taste of the local specialties with the visit. Among these, on the same eastern shore of Dali, the renowned Xizhou (喜洲): famous for its really fine homes, it is possible to attend a show of Bai dances organized for tourists here; in Zhoucheng (周城) instead, go if you’re interested in colored textiles with the batik technique or tie-dyeing, which here are specifically called zaran (扎染); or also Shaping (沙坪), where at the local Monday market you could be the only different face; and further on, still on the Lake’s east side, Shuanglang (双廊), a laid back fishing village. South of Dali, about 70 km further down, there are the areas inhabited by the Hui Muslims and Yi. Not that they don’t exist in the county of Dali, but these are their areas of origin. In particular the Donglinghua and Weishan (巍山). The Bai have a long history that has its origins in these areas and is tied to the already mentioned Kingdom of Nanzhao. Yunnan is the region where they are most numerous, but are also present in Guizhou and Hunan. They are distinguished locally because they wear finely decorated clothing with a preference for white (in fact Bai 白 in Chinese means white); single women braid their hair and wear head coverings with long cords that look like spaghetti, which they cut once they get married. 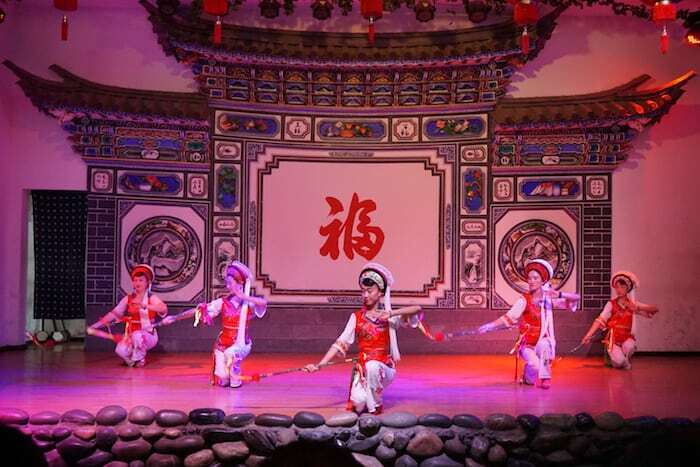 The Bai are excellent dancers thanks to a long musical tradition, and are also known for the typical characteristics of their residential areas, which over time have developed into their own architectural style. The use of marble and wood are widespread in these buildings: in fact the entire area of Dali if full of this hard stone, to the point where in Chinese, marble is translated into “Dali stone” not surprisingly, 大理石. The interior of homes include a garden and special wall, onto which according to tradition the sun’s light should be concentrated. Observing the decorations of the entrance doors, you can guess if the head of the household is the woman just by noting if the highest decorated animal is a phoenix. 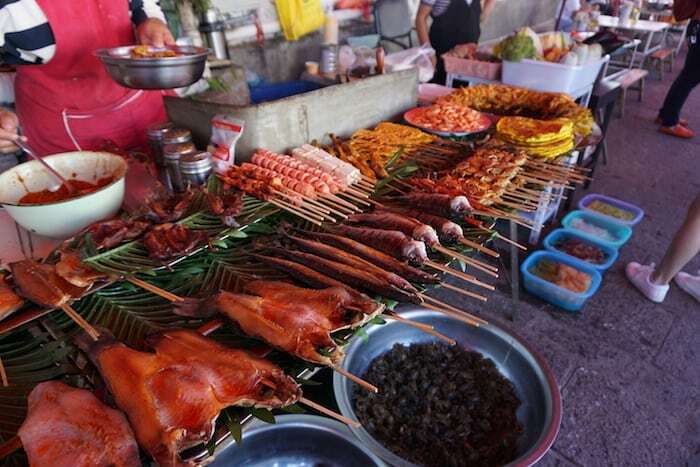 As able fishermen, the Bai offer a special suanla yu (酸辣鱼) even if the majority of their dishes are prepared with pork or chicken meat (as a mid-morning snack, you can have a piece of pork rind, how great…). At the market you’ll find pickles in abundance, and obviously lots of goat cheese! The area is full of marble quarries and silver mines, and for this reason handicrafts are still active in the old city. Rather, you need to be careful to stay away from “trash”. These go from massive silver trinkets that you buy by weight, such as bracelets as large as a bone or often as handcuffs. However, in the finer stores, you can also find minutely worked rings and even thermoses with embellished finishes (considering how they’re used in China, a silver flask is an imperial gift). 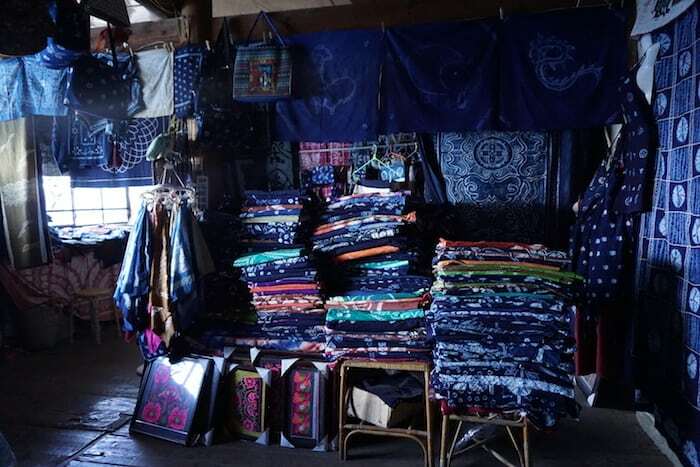 Next to this, locally made tie-dye textiles are exquisite. The majority use the natural blue of indigo; the color doesn’t fade with washing if it is first prepared by soaking it in a salt bath for a few hours. Certain works, rigorously handmade, are so painstaking as to require months: to give an example, to design different circles, they include grains of rice one by one before adding color. And then, once the textile has been treated, the same grains of rice are taken out of the material one by one. And voilà, a work of Amenuensis, which are obviously paid for such. I can recommend “Happy Embroidery di Yu Ling Li”, a nice girl that tenaciously carries on the family tradition. Her shop (namely her house) is at Xizhou, 26, Rangyi alley (大理喜洲镇染衣巷26号), liaoningyhm@163.com. But the mushrooms aren’t the only specialty. Prune alcohol has a really long history: it is prepared in fat skin bottles, with various gradations and enriched by various scents. It is sublime when used for cooking, especially when making pork and prunes. A typical restaurant both in style and architecture is Meizijing Jiujia (梅子井酒家), which prepares the prune liquor in house and offers lots of dishes full of local products. As a last recommendation: if you arrive in the evening and stay on the most popular roads without allowing an early morning walk in Dali or go off the beaten paths, all that will remain for your eyes and ears are crowds of people. Or worse yet the locals’ loud music. So, don’t stop at the first impression, but earnestly search for the Dali hidden by the violence of tourism. It’s still an esquisite place. Do you have any doubts? Leave a comment here below!